Puddings are one of my favorite goof-proof easy desserts. I like making them half of the main event, with the addition of seasonal fruits. Now mangoes are definitely not local to me in the NW, but mango season throughout much of the world is in full swing. Mexico, The Phillipines and India are blowing up with mango love right now. It's one of my greatest dreams to attend the mango festivities in Mumbai that take hold for the month of May. 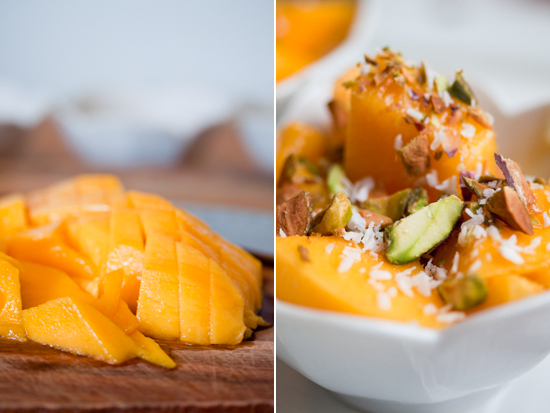 There are over 50 varieties of mango, which are folded into every edible morsel imaginable! I can't think of a better delirium than the mango-mania I'd succumb to if presented with so many luscious mangos! For the months of April and May, I buy a mango almost every day, waiting for it to ripen on my window sill till it's tender and ready . . . Then I throw the fruit into savory dishes such as atop tacos and cabbage slaws, or sweet incarnations such as folded into crepes or swirled into yogurt or simply sucking it off the seed over the sink, surely one of the fruit's most naked and glorious ways to eat a mango. 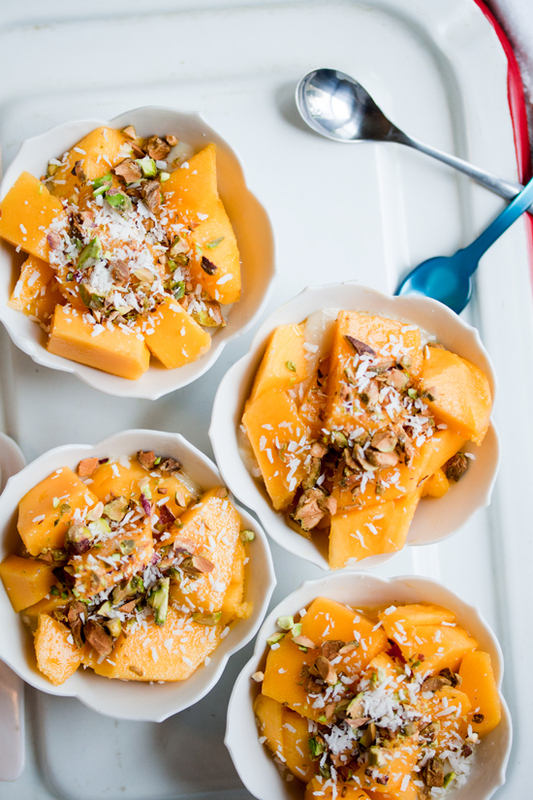 This evening, I thought of the sweet rice puddings of India and went from there -- the coconut cardamom adds a floral note that compliments sliced mango perfectly. Like a bouquet for your palet! Pistachios, they are the best garnish, so underused in Western cooking -- but a small stash will serve you well, for they add the rich saltiness to balance any sweet and, their color is sublime. In a small pot, on medium-high heat, whisk the almond milk, honey, sugar, cardamom, vanilla and almond extract together until warm. In a separate bowl, whisk the corn starch and water together. Add the cornstarch mixture to the milk, add the flour, salt and coconut and whisk, stirring vigorously (there may be a few lumps of flour, but they'll go away shortly). Stir on medium heat until thickened, about 3 minutes. In another small bowl whisk the egg yolk thoroughly. Add a few tablespoons of pudding mixture to the egg yolk and whisk again (you are tempering the yolk, so when it meets the pudding, it doesn't curdle). 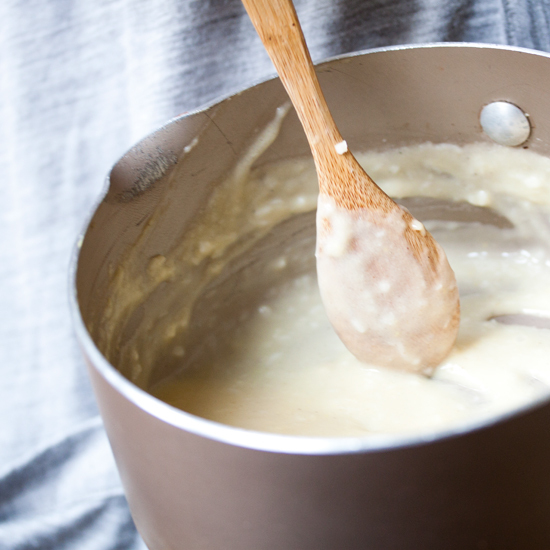 Finally, whisk the yolk mixture into the pudding -- the pudding will become creamy in color. Cook for another 3-4 minutes, until pudding is thickened, and the yolk has cooked. Chill for a few hours before serving with the mango (or any other fruit you like!). Garnish with coconut shreds and crushed pistachio. I love to reserve a little of the pudding cream for my morning bowl of oatmeal -- it's the best! 50 varieties!!!? I honestly thought there was only one. Now, I must have one of each. Count me in for the festival. Oh Leela Cyd. You tantalize me so! Cardamom, pistachios and coconut are three of my favorite flavors. I haven't had any mangoes yet this year, something that needs to be rectified! This looks like my kind of dessert. I love that it's made with almond milk...I try to stay away from cow's milk generally. Yummy! The colours and flavours in the dish are some of my absolute favourites! A beautiful pudding recipe!! What a wonderful combination of flavors. Beautiful to look at and surely to eat! We are dairy free, so I am always up to try a pudding with almond milk! Yummy, this is the perfect snack for me. I want to go to the mango festival in Mumbai too! Oh wow! This sounds heavenly! Beautiful photography as well!